I recently watched an episode of "The Dead Files" where the investigators checked out the familiar Villisca Axe Murder House in Iowa. I say Familiar, because this is not the first time this home has been investigated. The first time I heard about this haunted home and it's history was when it was investigated by the Ghost Adventures team. They went there on behest of the home owners who grew up there (as I recall) and were truly tormented by their memories of the noises and experiences they had there. The guys went in respectfully when trying to communicate with the murder victims of this horrendous crime scene. So, what's the history? Ah, well, if you are unaware, in 1912, 8 people, including children, were killed in their sleep, one by axe, the rest by the back of the axe head. The crime is still unsolved and infamous by its brutality and young victims. What's changed? Since the Ghost Adventures team investigated, the owners of the home have turned it into a haunted attraction. What's my beef? I dunno. Is it too soon? Is it because of the young victims? 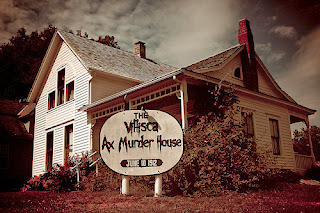 Is it because of the blood dripping font on the sign out in front of the house that disrupts my calm? My question to you.... Is it ethical, moral even, to turn a crime scene like this into a tourist attraction? How is it different than the Lizzie Bordon House, you might ask... Well, in my opinion, it is because it doesn't involve children first of all. If it was presented in a different way, would I feel better about it? I don't know.